P-values are hard enough to understand — the appear ‘magically’ on the screen — so how can we best communicate the problem of p-hacking? 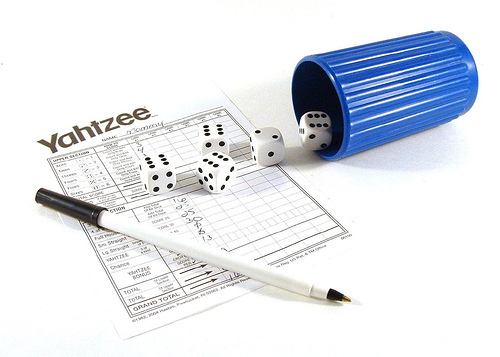 How about using Yahtzee as an analogy to explain the intuition of p-hacking? In Yahtzee, players roll five dice to make predetermined combinations (e.g. three of a kind, full house). They are allowed three turns, and can lock dice. Important for the analogy, players decide which of combination they want to use for their round after the three turns. (“I threw these dice, let’s see what combination fits best…”) This is what adds an element of strategy to the game, and players can optimize their expected (average) points. If the implications are not clear enough, we can play a couple of rounds to see which way we get higher scores. Clearly, the Yahtzee-way leads to (significantly?) more points — and a much smaller likelihood to end up with 0 points because we failed to get say that full house we announced before throwing the dice. Sadly, though, p-values are designed for the forced Yatzy variant. < Previous Education as a Career?